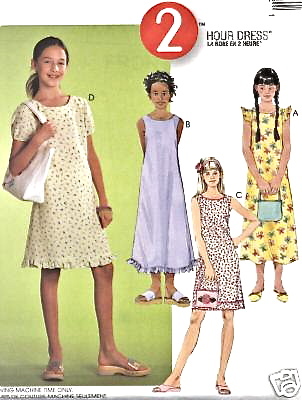 2 dresses, 1 skirt and no nap - Stop staring and start sewing! It wouldn't feel like Easter if I were able to sit in church without my head slowly nodding down and then suddenly snapping back up as I try to fight off the need for sleep. This year I did better than most and was only up sewing until 1:00 since I figured the girls are all old enough to snip their own threads and iron their outfits in the morning. But everything turned out quite lovely I think and I was able to appease that little "why don't you sew for your OWN kids?" devil that sits on my left shoulder most of the time (gimme that pitchfork you little creep). Peety's dress took most of my energy (both mental and physical) as it was a new pattern and needed some altering in the bodice back to narrow it. I like this pattern but didn't want the shoulders to tip out so far so I angled them in a little and was very pleased with the outcome. She found this fabric at the thrift store for 99 cents and got the pattern (Simplicity 3777) for 1.99. Woohoo! Here's a peek at the finished dress. The bag, the nails, she didn't miss a beat! I used my favorite skirt pattern for Olivia's skirt. 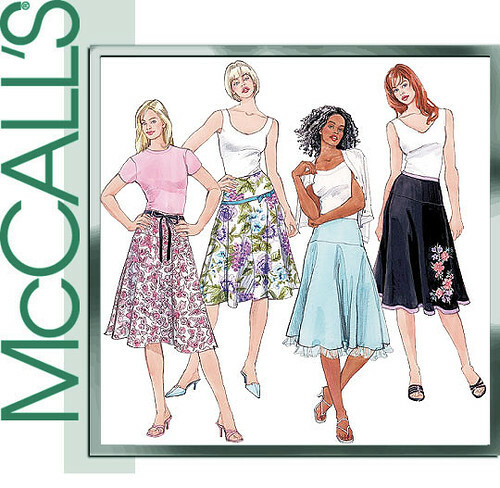 It's McCalls's M4783 and it's so simple, cute, and stylish. It has a short zipper in the back but it's so easy to install because you just have to attach it to the two small yoke pieces and the rest of it is a breeze. I snuck a picture during church which was easy to do since we were in the absolute last row. That's what happens to people who show up late on Easter Sunday, they sit in the row of shame (and snap pictures while nodding off). It was a gorgeous use of Sandi's Lily Pad print (and I love the vintage lace peeking out from underneath). Fortunately I saved Sofia's dress for last. It's real easy and I've made it before so I could kind of sew on automatic while trying to keep my eyes open (it helped that I had a quasi-scary movie on too). Here's the pattern. It's McCall's 3134. I think it may be out of print but I did see one on ebay. Here's the outcome. 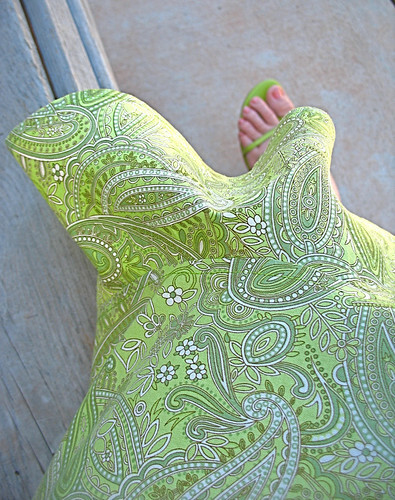 She picked this perfectly Springy fabric from the Sun Drop line. She's even got cute little Trash Tie buns in her hair which is nice since she would've preferred a cowboy or pirate hat if given the choice (there are days when I just have to put my foot down, and Easter is definitely on of them!). I wore an outfit I made for Easter 3 years ago. Since then I turned 40 and had a baby so I was just pretty darn tickled I could zip it up (and breathe!). 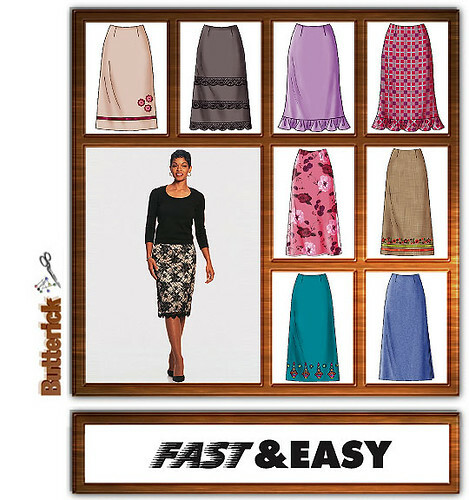 It's from Butterick 3597 and it's a great pattern with a decent selection of options to make it interesting. Here's a peek with my matching shoes (still thrilled I was able to find these!). Boring toe nail color I know. I have to show off the guys too. They all looked so handsome and the baby got a lot of attention with his little clip-on tie (which is so tacky it cracks me up). 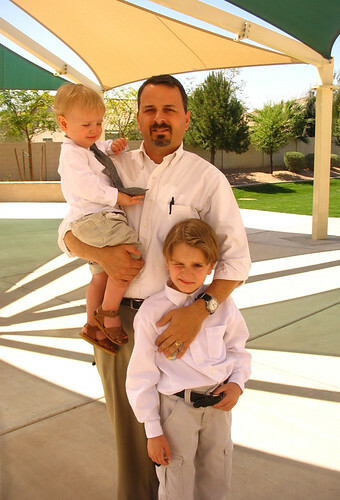 Walmart is actually a great source for basic white button down shirts for boys (at any time of year). And since they don't wear them too often it's nice to not spend a fortune on them. Now I'm heading down to the fridge for more ham, deviled eggs, carrot cake and banana cheesecake (which my guys made. Go guys! ).